In spring and summer both sexes utter courtship notes that begin with a series of loonlike wailings. Description: Sexes similar. 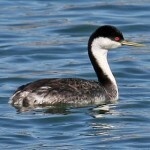 Large grebe with long, yellowish bill. Winter birds with dusky throat, white of chin extends onto rear of face in a crescent; back and wings brownish; dark brown crown and forehead. 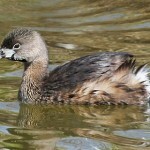 Immature birds resemble winter birds but have little white on cheeks; bill grayish or pale. 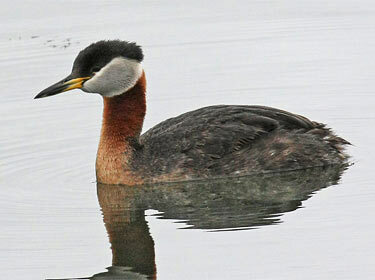 Nebraska Seasons: Look for Red-necked Grebes on large lakes and reservoirs in late October. Habitat: Rivers, lakes and reservoirs. Where in Nebraska: Accidental visitor in summer. Rare casual fall migrant across the state. No breeding records in Nebraska. Field Notes: Generally solitary; often quite shy. 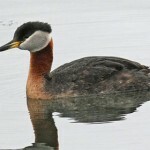 Fun Facts: Red-necked Grebes regularly eat their own feathers to create a matted plug in their digestive tract, possibly to act as a filter or hold fish bones in until they can be digested. They also feed their own feathers to their young, possibly for the same purpose.